There is a wide range in the quality and life spans of retaining walls. 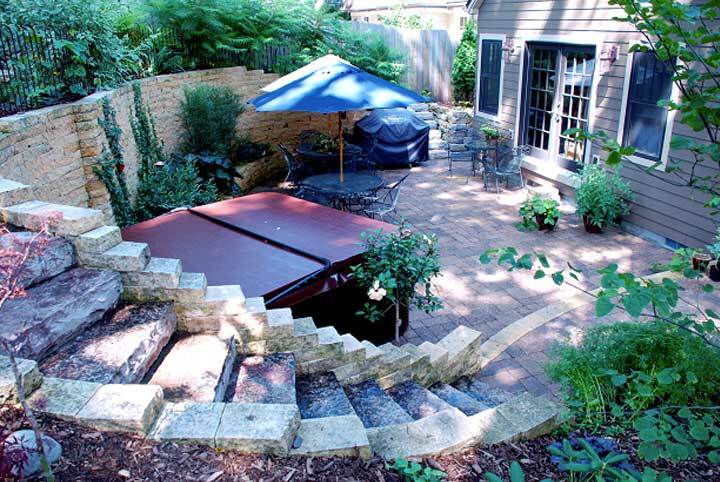 At Blue Iris Landscaping LLC we design walls that improve the looks and function of your yard. We have been trained and certified by the Allen Block Corporation to design and build retaining walls that will last for years. To make a retaining wall last, we do an analysis of the soil type, water flows and slope of the terrain to determine the proper depth of the base, and the thickness of the gravel backing behind the wall. If the wall is over three feet in height and it is determined to have significant pressures behind it we will place Geo Grid layers into the gravel backing to act a drag anchors behind the wall. A good base and backing preparation will stand up on its own (temporarily) even without the stones. As we build up the gravel backing we place drainage pipes behind the wall to let any excess water out. The freezing and thawing of water behind the wall eventually destroys a retaining wall. After a proper base and backing are established we fit the stones together by cutting and grinding to prevent the backing material from easily seeping out between the stones.